Bullish crab harmonic chart pattern is rarely found on the price chart. It is an XABCD chart pattern, that suggests a long entry upon completion. The D point of the pattern confirms the pattern completion. This post going to explain the way to find the bullish crab harmonic chart pattern on price chart, and the way to trade a bullish crab harmonic chart pattern. How to draw a bullish crab harmonic chart pattern? 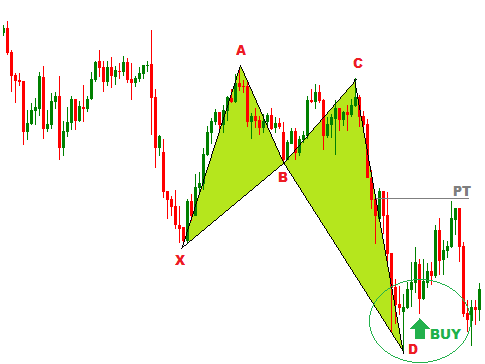 To find or draw a bullish crab harmonic chart pattern, first we need to find the X and A points of the pattern. X and A points are found on the bottom and top of a bullish trend respectively. In the next step, we need to find the B point of the pattern. 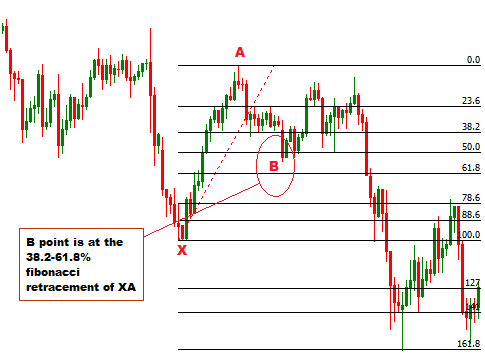 To find the B point, draw a fibonacci retracement tool from X to A, and the B point will be confirmed, if it is at the 38.2-61.8% fibonacci retracement level of XA (AB/XA=0.382-0.618). Have a look at the following illustration. Now we need to find the C point of the bullish crab harmonic chart pattern. To find the C point, draw a fibonacci retracement from A to B, and C point should be at the 38.2-88.6% fibonacci retracement of AB (BC/AB=0.382-0.886). Here in this step, we are to confirm the D point of the pattern. 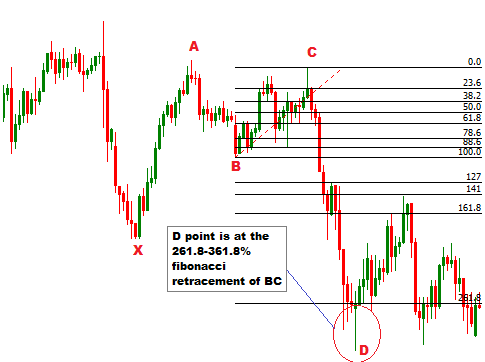 To confirm the D point, we need to draw a fibonacci retracement tool from B to C. The D point should be at the 261.8-361.8% fibonacci retracement of BC (CD/BC=2.618-3.618). In this step, we reconfirm the D point of the pattern. The D point should be reconfirmed because in the previous step the D point is not accurately found, rather it is found within a range of 261.8-361.8% fibonacci retracement of CD. To reconfirm the D point, we are going to draw a fibonacci retracement tool from X to A. The D point should be at the 161.8% fibonacci retracement of XA(CD/XA=1.618). This step need not to be done on the live chart while trading. Draw the XA, XB, AB, BC, BD, CD straight lines to find the pattern in the form as illustrated above. 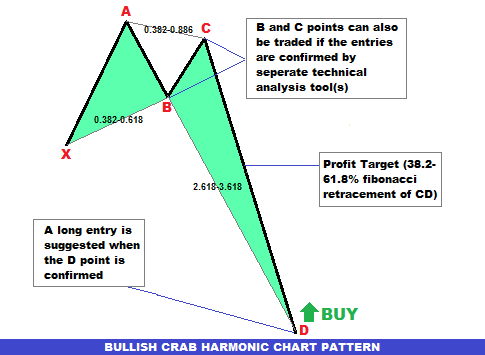 How to trade the bullish crab harmonic chart pattern ? Simply, a long entry is suggested upon completion of the bullish crab harmonic chart pattern. 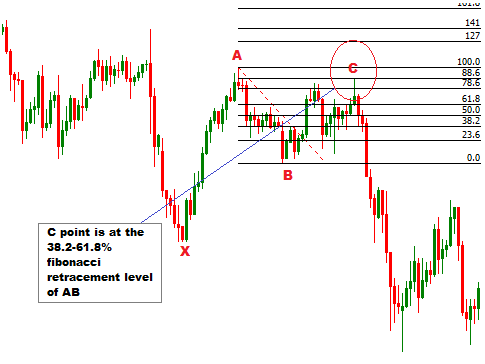 B and C points, specially C point, can also be traded if the entries are verified by other technical analysis tool(s). 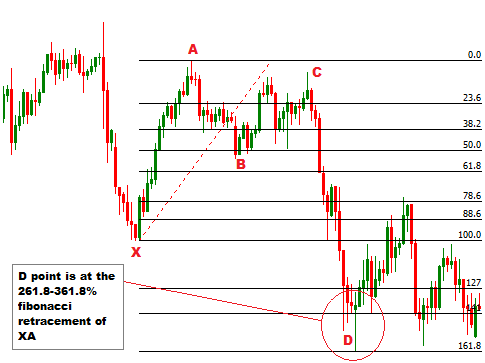 The profit target for the order at D point should be placed at the 38.2-61.8% fibonacci retracement of CD. The stop loss for the order at D point should be placed little lower than the D point or other resistance levels below the D point. I hope this harmonic chart patterns will help you to gain some pips more confidently. You can drop a comment below, to join the discussion with other traders, and subscribe yourFXguide to receive the updates. Thank you & Happy Trading !! !